The perfect choice for brides looking for added accentuation on the small of their waists. This Regency Organza designer ballgown from Stella York is the perfect combination of sophistication and sparkle. 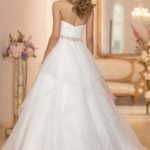 The figure-flattering fitted bodice features a sweetheart neckline, and ruched pleating that plunges into a waist-accentuating diamante band. The back zips up under crystal buttons. Choose from traditional white or romantic ivory. This curve-hugging wedding dress is available in plus sizes.